angono | let's go pinas!! Every November 22 to 23, the giants of Angono, Rizal gather once more to participate in the revelry of the town fiesta for San Clemente. Made from either fiberglass, plastic resin or the traditional papier mache, characters whether in human form or otherwise, are proppped up and paraded along the main streets of the town right beside Laguna de Bay. 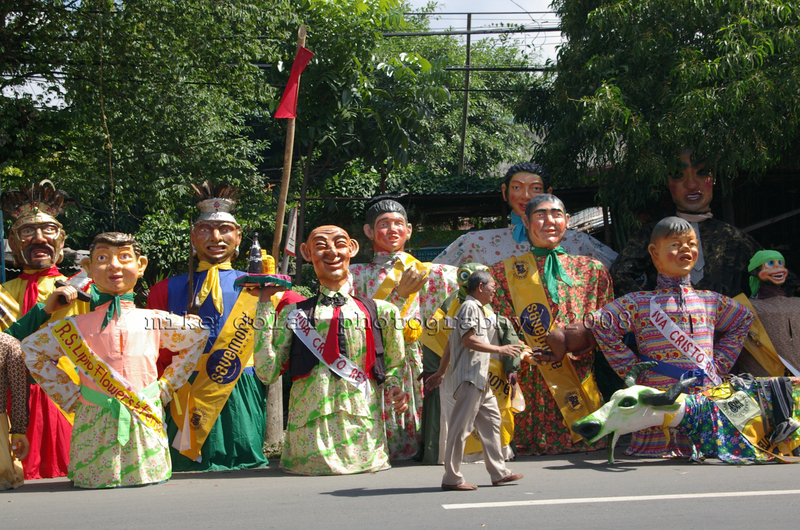 The ten to twelve foot colorful “higantes” (giants) are products of this town’s indigenous folk culture. Some higantes depict the family in folk costumes from the parents down to the grandchildren. Some are familiar entertainment creatures such as Pong Pagong and Kiko Matsing of Sesame fame. And since Angono is both pastoral and bayside, naturally gigantic carabaos, humongous shrimps, and even enormous ducks are presented as well. Many say that the Higantes Festival evolved from the tyranny of the farmlords during the Spanish Colonial Era. The oppressed farmhands created the first higante form, symbolic of their tormentor, and displayed it along the dusty roads, and mocked it through some finger pinching (in a way, a mild form of revenge (higante’) – which tagalog translation of the word could also be another origin of this tradition). Totie Argana, one of the participants who have created many of these Higantes in many years, surmised nothing sinister nor dark about the beginnings. He avers that such forms were akin to the western farmlands’ scarecrows, utilized to shoo away birds during the Spanish regime. Michael, family member of the notable Blanco family, traced the higantes history to a more recent era – right after the Japanese Occupation in the 1940s. Just to perk up the interrupted (because of the world war) tradition of the town fiesta, giant mannequin forms were developed, and were proven to make the San Vicente Festival most colorful and exciting. But it was through the initiative of restaurateur-painter, Mr. Perdigo Vocalan who called the attention of Department of Tourism, and made the Higantes Festival as important as the other festivals around the country. It was just as swell that miniature higantes (a paradox, isn’t it) are scattered among the many folk arts in his famous Balaw-balaw Restaurant as shown by daughter-in-law and resto manager, Luzvimin Vocalan. The Higantes Festival only illustrates the genteel yet passionate character of the people of Angono where the people’s artistry is made even more siginificant by the town’s actual giants and geniuses.